Amidst the steep bluffs of southeastern Wisconsin, in a shallow valley where three rivers join before flowing into Lake Michigan, lies an unexpected gem. It’s a small but glittering one, a city that, despite its old world charm, geographical beauty, and longtime liberal leanings, has somehow been underrated for decades—either overshadowed by the megawatt metropolis of Chicago 90 miles south or wrongly cast as just another decaying, rust-belt ghost town. But Milwaukee is neither. Ever since its early days as an agricultural port and brewing capitol, Wisconsin’s largest city has been a magnet for industry, immigrants, and intrigue. And now, thanks to a downtown building boom and an influx of new restaurants, bars, hotels, and shops, the city’s diverse and highly walkable neighborhoods are experiencing a revival that’s drawing visitors like never before. Of course, many longtime residents will tell you that Milwaukee has always been cool: a Midwestern city that feels like a coastal one, where sailboats bob in the harbor and golden beaches stretch along a shockingly blue shore. They’ll tell you that Milwaukee feels surprisingly European, too, with German, Polish, and Italian roots so deep that a myriad of imported traditions have blended to form a singular culture based on some very good things: beer, festivals, and food. “In the summer there are fireworks nearly every night and festivals in every neighborhood. Milwaukee has always had a strong identity, and a broader world view only makes us stronger,” explains William Seidel, co-owner of the acclaimed beer bar Burnhearts and the farm-to-table restaurant Goodkind, both in the neighborhood of Bay View. Its affordability and down-to-earth sensibility has made Milwaukee a place where local creatives and hedonists of all kinds can thrive—a city with plenty of its own local businesses and bands; a city where people gather in the twinkle-light-filled beer gardens that dot verdant public parks; where live music flows from open tavern doors, and it’s not uncommon to spot bikes and surfboards strapped to the top of cars—even in the winter. And, as Meyer is quick to note, the city is damn good looking, too. “Being on the shores of Lake Michigan, the views are unbeatable. So many people visit our shop from the east and west coasts, and they are amazed by how ‘cute’ Milwaukee is; they’re impressed by the mix of architecture—the historic buildings and the super modern design.” Take, for example, City Hall, noted for its terra-cotta hue and intricate Flemish Renaissance Revival style, and the now-iconic Santiago Calatrava-designed edition of the Milwaukee Art Museum, with a winged glass atrium that rises from the edge of the lake like a bird taking flight. The refurbished warehouses of the Historic Third Ward are home to many of the city’s art galleries, design firms, retail shops, and restaurants. The Journeyman, a recently-opened Kimpton Hotel, makes a fine base to explore it all. 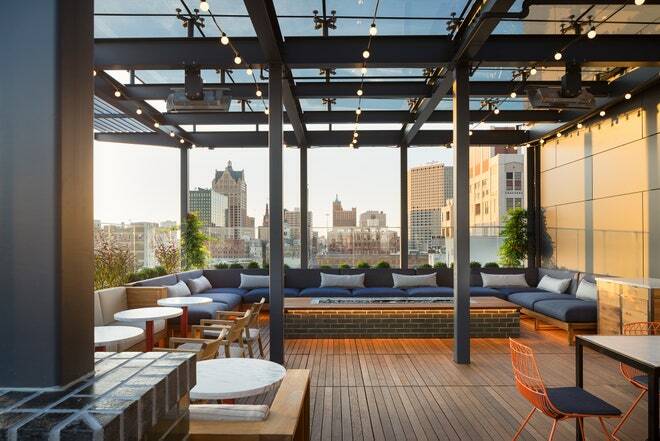 The 158-room hotel boasts a gorgeous roof top bar and restaurant and an eclectic, industrial-chic design. It’s within walking distance to downtown and the River Walk, and just a few blocks from the Milwaukee Public Market, a bustling food hall offering artisanal Wisconsin cheeses, locally-made sausages, and Thief, one of the city’s best wine shops. Bay View, at the southern edge of the city, is a lakefront neighborhood known for its cute arts and crafts bungalows, hip bars and restaurants, and youthful vibe. To get a feel for this beloved neighborhood, book a room at Kinn Guesthouse, a minimalist mini hotel with exposed brick walls, a cozy ground-floor restaurant, and communal outdoor fire pit. Across the street, the California-inspired shop URSA is worth a visit, too; it sells a cute mix of mystical treasures—Palo Santo, Southwestern textiles, apothecary items made in-house. The eclectic and industrial Walker’s Point neighborhood is home to many of the city’s best Mexican restaurants, a vibrant LGBTQ nightlife scene, and a number of chic restaurants. Stay nearby in the luxe, motorcycle-themed Iron Horse Hotel (which, incidentally is not far from the Harley Davidson Museum) or venture south to Burnham Park where a lovingly refurbished Prairie Style home designed by famed architect (and Wisconsin native) Frank Lloyd Wright is available to rent for overnight stays. 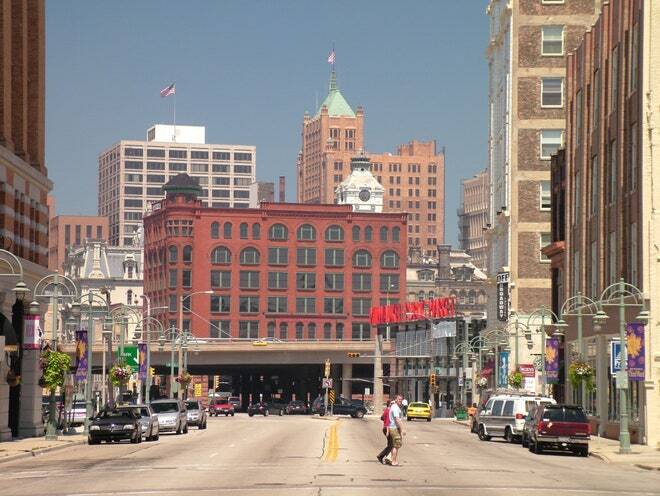 Thanks to its proximity to the University of Wisconsin-Milwaukee and downtown, Milwaukee’s Eastside neighborhood has long been one of the city’s most charming, drawing a diverse crowd of foodies, students, and night-time revelers. Comet Cafe is a beloved stop, known for both its vegetarian options and its bacon-garnished Bloody Marys (served, as is customary in Wisconsin, with a tiny bottle of beer on the side). For a more refined dining experience, make a reservation at Ardent; the tiny restaurant tucked beneath an apartment building that offers an ever-changing tasting menu and has been nominated for several James Beard awards, including one this year. While in the neighborhood, be sure to make a stop at Von Trier’s. The century-old, German-themed bar is quintessential Milwaukee: dark, cozy, and gorgeous, with a wall of stained glass windows, a massive wood bar, and a hearty menu of Spatzle, Bratwurst, and Knackwurst. Afterwards, pop your head into the famed Oriental Theatre across the street for a look at the elaborate, East Indian-inspired Art Deco decor. No trip to Milwaukee would be complete without partaking in a classic Friday Fish Fry—an old Roman Catholic tradition that’s evolved into a raucous weekly affair. The menu usually features locally-caught lake perch and an outrageous amount of carb-y sides: potato pancakes, coleslaw, rye bread, and corn. Lakefront Brewery does a particularly fun version, with a live polka band, dancing, and—of course—plenty of house-crafted beer. 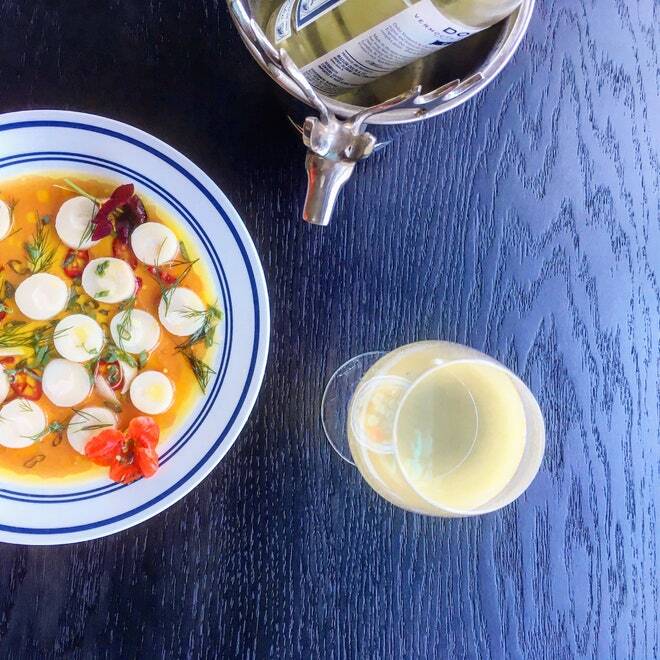 For a slightly lighter evening, head over to Odd Duck in Bay View. The small plates restaurant serves an always-changing menu featuring seasonal ingredients under global influence—everything from charred octopus with taro chips to Oaxacan hibiscus empanadas. Finish the evening with a nightcap in Walker’s Point at Boone and Crockett, a backwoods-inspired bar with an always-busy patio and a cool taco truck out back. 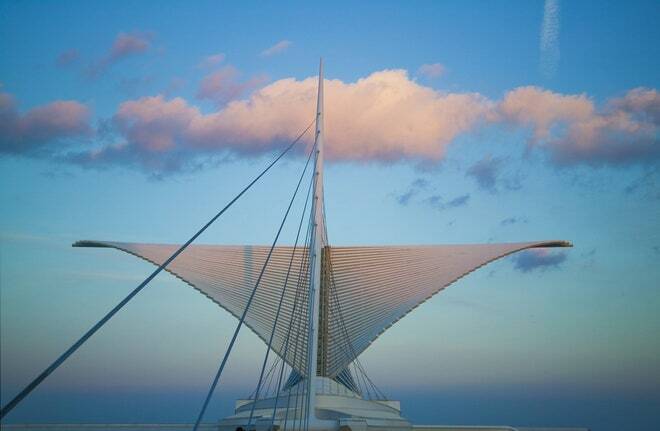 Be the first to comment on "Why Milwaukee Is the Midwest’s Coolest (and Most Underrated) City"